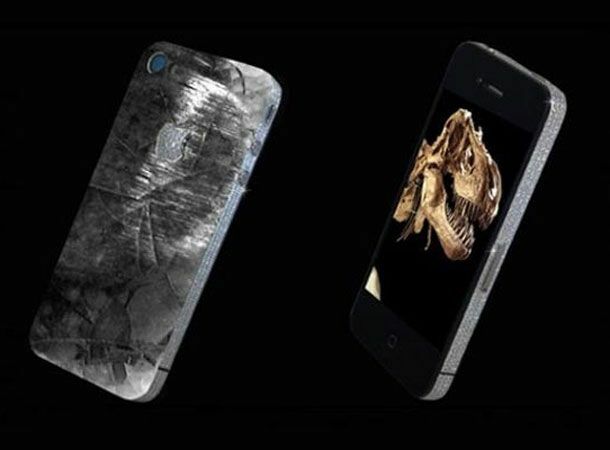 Stuart Hughes, the man behind the £5 million limited edition diamond-encrusted iPhone 4, has unveiled his latest Apple adaptation, an iPhone 4 with embedded Tyrannosaurus Rex tooth. The 'luxury electronics designer' combined the section of 65 million year old dinosaur gnasher with polished meteoric rock to create an Apple product that not only screams importance but is literally out of this world. Adding are air of elegance to the prehistoric styled gadget, Hughes has adorned the Flintstones-esque blower with a diamond and platinum crafted Apple logo and edged by an array of flawless 8.5 carat diamonds. Whilst the dino-touting design might not be as elegantly brash as its £5 million diamond-clad predecessor, Hughes' 10 History Edition iPhone 4s are expected to sell for £39,995 a piece. What over the top design features would you like to see plastered across an iPhone 4? Let us know via the T3 Twitter and Facebook feeds.